Seven years of building a Lancair ES and I am finally almost to the point of starting the engine. 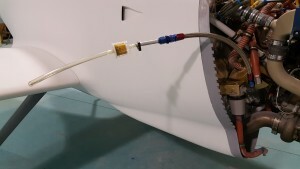 Aware of the fact that too many first flights suffer from fuel system malfunctions, it was time to comprehensively review and test my installation. Ron Galbraith, an experienced Lancair builder and flight instructor, had recently offered the constructive criticism that my fuel lines contained too many "hard 90 degree turns" which might impede fuel flow. So I took the opportunity to rework all my fuel and vent lines, replacing everything from wings to gascolator with slightly oversized Teflon-lined, Kevlar-braided hoses and full-flow fittings. Then I began testing as described in Bob Pastusek's LOBO article, Fuel System Inspection & Calibration. I removed the internal gascolator filter and temporarily installed a disposable in-line fuel filter as shown in Photo 2. 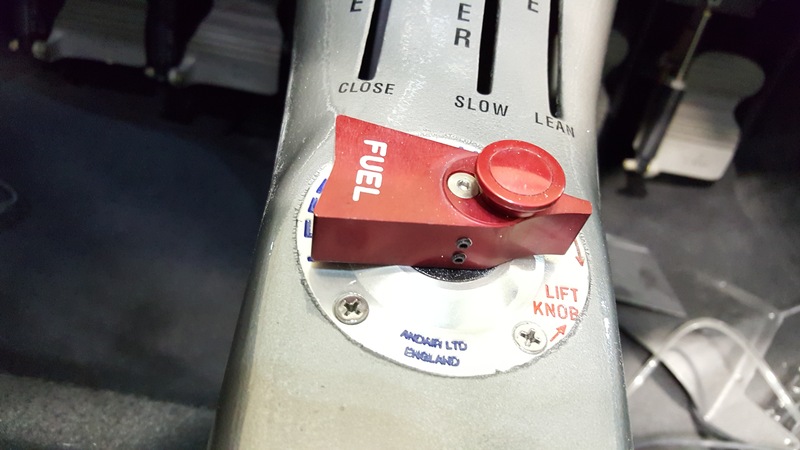 Then I filled the left tank with a measured 5 gallons of gasoline, ported the engine feed line into the now empty 5-gallon can, jacked the plane into a nose high left-wing low attitude, set the fuel selector to feed from the left tank and turned on the fuel pump. To my surprise the flow was rather slow and gurgled but continued through until I had 4.2 gallons back in the can. While I was able to definitively show an unusable fuel quantity for the left tank of ~0.8 gallons, the poor flow issue needed further investigation so I emptied the can back into the left tank and tried again. 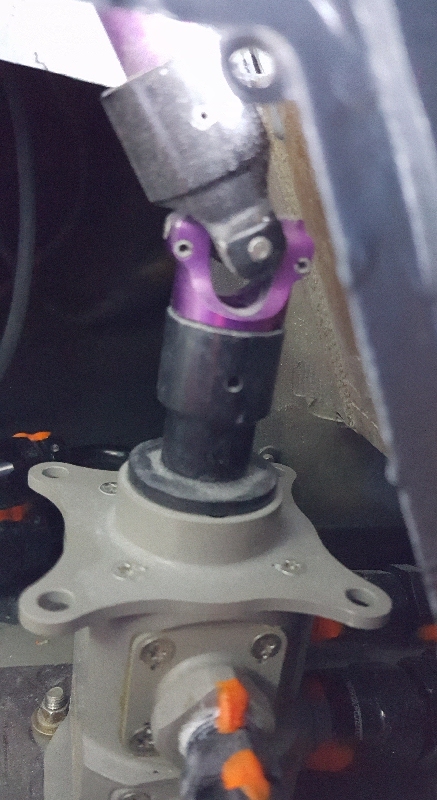 This time, while the pump was on, I did a little playing with the fuel selector and discovered that fuel flow was dramatically improved with the selector positioned 45 degrees clockwise from what was labeled as the "Left" position. After again recovering the 4.2 gallons, I repeated the entire process for the right fuel tank, only changing the plane's position to right wing low. I confirmed unusable fuel for the right tank is also ~0-.8 gallons, with a fuel flow restriction similar to the left tank. 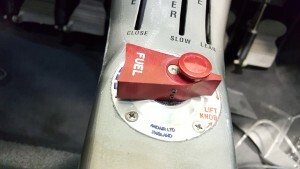 Again, the restriction disappeared by moving fuel selector 45 degrees clockwise of the "Right" position. 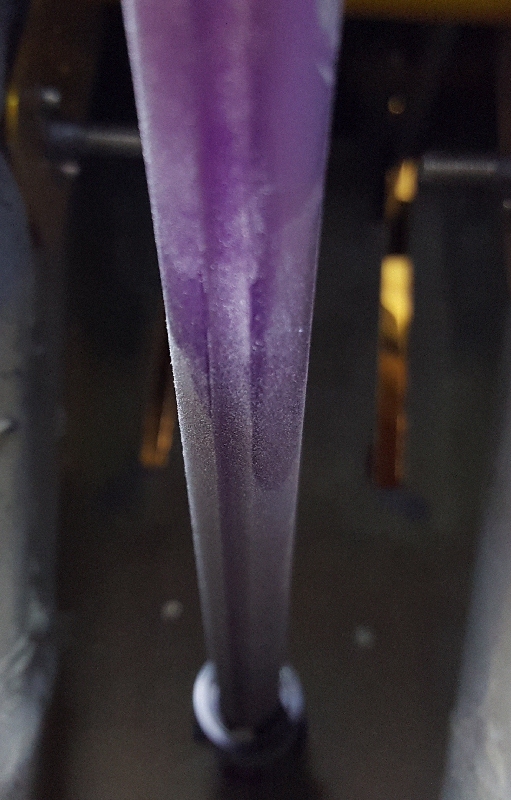 I had a guess what the problem was, and I confirmed it when I was able to flow fuel through the selector valve with it set to "Off." A further 45 degrees clockwise from "Off" yielded a complete shut off of flow. Somehow, my fuel selector was 45 degrees askew. My fuel selector is mounted within a center console as seen in the photo to right. In this photo the selector is set 45 degrees clockwise of the "Right" position (the notch in the spindle is opposite the direction the selector handle points to). In this position the valve provides excellent flow from the right tank. 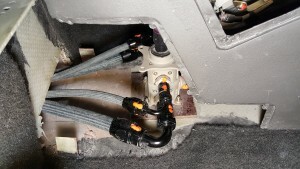 The duplex fuel valve itself is located about one foot lower on the floor of the plane. The selector and valve—both Andair products—are connected by an extension rod with universal joints at both ends. 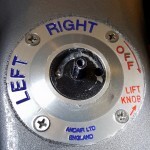 Both the selector and valve are oriented straight with respect to the plane and to each other, and installed per Andair's instructions and diagrams. 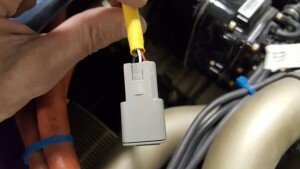 The three photos below showing the linkage were taken without changing the orientation of the selector. At this point I went on as recommended in Bob Pastusek's article titled Fuel System Inspection and Calibration to fully flush both tanks, determine total tank capacity and to calibrate my Princeton Electronics eleven-point capacitance type sending units, all without much difficulty. Then I reinstalled the gascolator and dismantled the fuel line from the intake manifold so that I could flush the fuel line components beyond the gascolator and while testing/calibrating my fuel flow sending unit and Grand Rapids Technology EIS and EFIS. 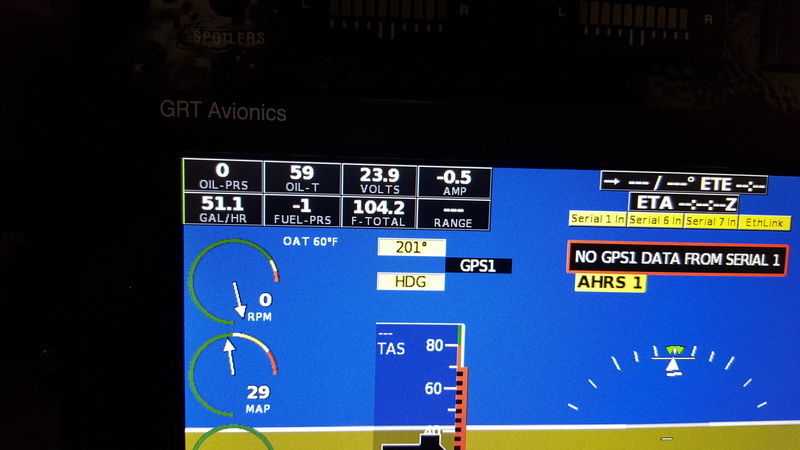 Another problem: no fuel flow showing on either the EIS or EFIS. 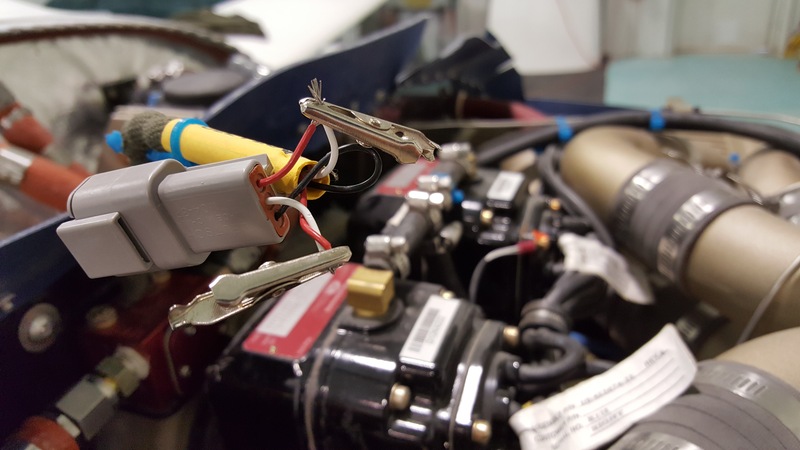 Long story short, after a bit of reading and lots of testing with a voltmeter I found that the power and signal wires of the fuel flow sending unit, as installed by Lancair during the "Engine Fast Build" which I bought 2 years ago, were reversed. 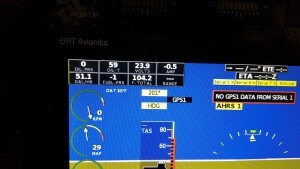 The photos below show everything properly connected, and a pretty darn good fuel flow on the display. Hurray! So to sum up, I would like to thank Bob and Ron and everyone who helped me work through these problems, and perhaps even more so to encourage anyone still building NOT to skip system and component testing—especially anything fuel system-related—before they think about flying.